The material palette is split into two sides. The left side shows the contents of gallery files on disk. Gallery files store instances of a node with various settings. Houdini ships with several galleries containing pre-made materials such as Burlap and Plastic. The settings for this tree view are the same as for the gallery manager. The right side shows the materials and shaders that exist in the scene. You may have loaded them from the gallery or you may have created them from scratch. Once you load a material from the gallery, you can customize it by changing its settings and contents, so materials in the scene may not match the materials in the gallery. Drag the material from the gallery to the right side of the material palette. Click the material in the gallery and then click the move over button. You can load several copies of the same material into the scene and customize them to look slightly different. Drag an on-disk material from the gallery onto the object in the scene view. This loads a copy of the material into the scene. Drag a scene material from the right side onto the object in the scene view. Select the object, select a scene material, then click Assign at the top of the material palette. Select the faces, select a scene material, then click Assign at the top of the material palette. This appends a Material surface node inside the object’s surface node network that assigns the material to the selected faces. Click the update all button to update the shader balls for all scene materials. 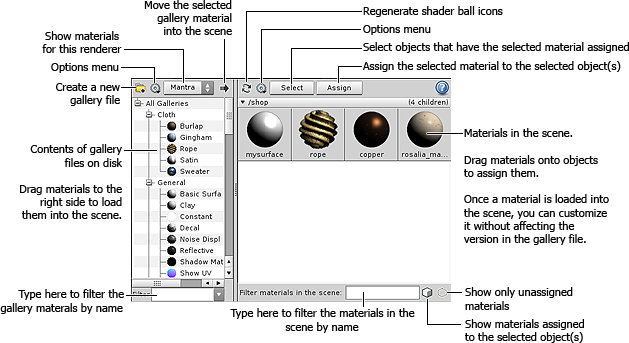 Right click a scene material and choose Update shader ball icon to update a single material.